All registered students may review our 138-question quiz by entering their password in the space provided below. A personal check made payable to Duane Gomer, Inc. Your credit card will be charged a total of $. This one-time charge will include all course materials consisting of the official Notary Public Handbook and the 138-question Practice Exam, attendence at one of our popular "crash course" seminars, and permission to test with the State administrators at the conclusion of the seminar. For those students who are registering within 4 days of the actual seminar, we will provide you with the password for downloading the Notary Public Handbook and the 138-question practice quiz. Unless you instruct otherwise, we will NOT send course materials. Refunds will not be available once your order has been processed or after special access accounts have been issue to you (whether verbally or in writing including all e-mail responses. All shipping orders will be processed no later than 12 noon the next business day. 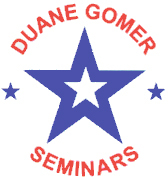 All orders submitted to Duane Gomer Seminars before 12 noon will be processed the same business day.